Built around an event loop, calling functions to react to events. All actions are non-blocking, so the app is "usually" waiting for events. 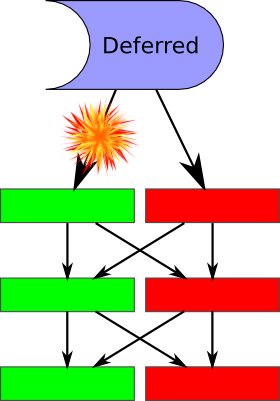 The system requirements for an asynchronous programming environment are the ability to do non-blocking IO, which means that functions like read and write will not block until data is available; and the ability to monitor multiple IO channels for activity simultaneously, usually via the select or poll syscall. Basic asynchronous style implements the idea of starting an operation: when a user clicks this button, call this function. But it breaks down when that function needs to do something more complex than drawing something onscreen - performing a database query, for example. We need something that can model an ongoing process without blocking. Sort of a deferred function return. Lots of useful utilities, protocols, etc. Twisted is not magic. Python continues to operate exactly the way you already know it does. It has an efficient and portable event loop, along with a huge suite of utilities, protocols, interfaces, and so on -- and I won't be talking about those here. Returned as a function result to indicate "I'm not done yet." 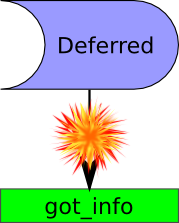 A deferred is "fired" with a result value when the operation it represents is complete. This is a very basic model of deferreds, but it handles the notion of ongoing processes nicely. This particular style, using nested functions, is my favorite, but lots of people use separate (un-nested) functions instead. Here two callbacks are added to the same deferred. This is a common pattern: get a deferred, add a callback to do your thing, and return the same deferred. 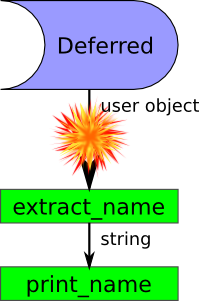 Note that the deferred is initially fired with a User object. The extract_name callback returns a string, which is passed to the next callback in the chain, print_user_name. This is where API docs are useful: mydb.get_user returns a Deferred that fires with a user object. get_user_name returns a Deferred that fires with the name of the user, or "(unknown)". What about error handling? What if mydb.get_user raises an exception? If get_page_title succeeds, then fail_info is never called. However, if the operation fails, then got_info is never called. Instead, fail_info is called wth a Failure object. Failures wrap Exception objects. Note that an exception in the original operation is not handled like this! Be careful that nonterminal errback handlers return f! This is the "full grid" of callbacks and errbacks. Execution can, in principal, switch back and forth from callbacks to errbacks several times for a single deferred. d = get_contacts(request.query['username']) # error checking!? This is a somewhat overwrought example of a full set of callbacks and errbacks. Note that, because it just logs the error, the errback for get_contacts always returns the failure, passing it along to ajax_get_contacts' errback. This is what I mean by a "nonterminal" errback. However, an exception in the callback for get_contacts (maybe a contact object without a username attribute?) will cause the errback in ajax_get_contacts to be called and it will report the error correctly. Note that the errback for get_contacts is not called in this case! There's still a bug here: if no username is specified, then ajax_get_contacts will raise an exception that probably won't be handled very well by the web framework (it will probably create a lot of HTML that will not parse as JSON). There's still a bug here: if no username is specified, then ajax_get_contacts will raise an exception. The web frameworkd is probably prepared to handle a failure, but not an exception. This is one way to solve the problem: shortcut the whole contact lookup, and return an already-fired Deferred object to the web framework. ..or handle it in a callback..
d.addCallback(get_contacts) # this returns a deferred! This moves the entire operation into the callback chain, by starting with an already-fired callback, and getting the username in the first callback. Callbacks always take an argument, and _ is a good way to indicate "I'm ignoring this argument". get_username returns the username, which is then handed as a single argument to the next callback. That callback is get_username which coincidentally takes a single arugment. However, it returns a deferred. Why does json_cb not get called with a deferred? Twisted automatically "nests" deferreds -- it basically adds the callbacks and errbacks from the inner deferred to the outer deferred. What actually happens is much more complex, since more callbacks and errbacks could be added to that inner deferred later, but let's not think about that right now. Note that infinite nesting (like tail recursion) is bad! Haven't talked about sockets or pipes yet! Deferreds are conceptually fairly simple, although there are some gotchas. Note that we haven't looked at direct asynchronous IO -- sockets, pipes, etc. In fact, Twisted generally uses function or method calls to handle those, e.g., lineReceived for the LineReceiver class. With some careful programming, deferreds can model both sequential execution and threaded execution. These "threads" are lightweight and can be created and destroyed easily, and of course synchronization requirements are minimal. Not following careful programming can lead to buggy, confusing spaghetti code. In particular, think about starting a new "thread" vs. sequential execution. This calls get_user_info for each username, and then bundles all of the resulting Deferreds into a single DeferredList -- in a fashion, it starts a bunch of threads and then joins them. 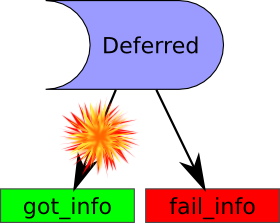 DeferredList's behavior can be customized easily; in this case, it fires when all of its constituent deferreds are complete (fired or failed). It ignores errors internally (consumeErrors), and passes back a tuple (success, result_or_failed) for each deferred. Note that callLater does not use a Deferred -- just a callable. The countDown function is on example of how a function can return a deferred and schedule it to fire later. LoopingCall calls its method on a schedule, specified to the start method. It is often used to poll for changes, e.g., in the filesystem. If you feel like you need these, then there's probably a design error somewhere. A word of warning about Twisted: outside of the Twisted core, there are many abandoned projects. Usually the older projects, labeled "deprecated, use $newstuff", are the projects you want to use. The $newstuff was often never finished, or at least never documented. For example, Axiom replaces Enterprise, but Axiom is not ready yet. Stick to the core, and do not be attracted by shiny things which sound like they might be useful. If in doubt, ask other Twisted programmers who did not work for DivMod. Twisted's unittest is almost the same as Python's, but setUp, tearDown, and test methods can return deferreds. Need more tests in buildbot/test!